Perhaps you have heard or read about a brand new Pattern Collection? It’s called The Carried Away Pattern Collective, and it’s brought to us by none other than Alicia Miller of Swoon Patterns along side Celine Allaert of Blue Calla Patterns. For bag makers discovering this partnership for the first time, it must be akin to discovering Peanut Butter Cups for the first time. How did anyone ever get by without this perfect pairing? …and why didn’t they think of it years ago?! We (as bag makers) can NEVER get enough of a trendy and well written bag pattern and the pattern market is flooded with them, but these 2 designers are the cream of the crop. They consistently produce well written and thoroughly tested bag patterns. The Carried Away Collective is comprised of a 6 month subscription for bag patterns. On the 15th of each month from August 2018-January 2019 subscribers will receive a new pattern in their accounts to download. This pattern will have been kept a secret until it is released into the download accounts. The theme to this collection “Every Day Bags” bags. To become a member, it is a cost of $35USD. This is a 1 time fee. You get the all 6 patterns for this price. You can join anytime in the 6 months, and upon joining the already released patterns you will receive immediately..with the others following on the 15th of each future month until January. There is even a dedicated Facebook group for support and showing off your bags of course! I’m so excited to show you my tester for the first pattern in the Collective. August was a Swoon bag and so this is Sierra Zip Top Bag. It’s got a pocket inside as well as an exterior slip pocket for a phone. There’s an optional cross body strap that can added as well. My bag is done in Faux leather with a black and beige twill fabric. It has a slightly slouchy feel to it, but it could be firmer if one chooses to beef it up with foam or additional layers of fusible woven interfacing. This bag is quickly done once you have finished your strapping! I do recommend Double Sided Tape to do those= Total time saver! So, what are you waiting for?? Go get your subscription! Stay tuned for September’s release by Blue Calla. Categories: Carried Away Pattern Collective, Pattern Reviews, Uncategorized | Tags: bag, blue calla, carried away, review, sierra, subscription, swoon, tester | Permalink. I am a proud Canuck and this year marks my country’s 150th birthday. 150 years since Confederation, wow! There’s quite a bit of kerfuffle going on “From Sea to Shining Sea”. To mark this occasion, I have joined this Canada 150 – It’s in the Bag Blog Tour to show off all of my 4 Blue Calla Tote Bags done up with this theme in mind. First, a bit about Blue Calla Patterns: Blue Calla is a Canadian pattern creating business operated by Torontonian, Celine Allaert. 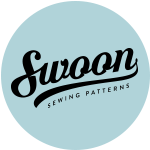 She has been creating original patterns for 4+ years, after sewing custom bags for people in her Etsy shop for many years prior. Her patterns are precisely written, photographed, tested and delivered to her customers by way of PDF, (she offers some in paper form as well). You’ll find her patterns to be either trendy or classic, but always unique. If you are familiar with Blue Calla’s patterns, then obviously, you already know the tote patterns are anything but ordinary. You can get a basic tote pattern anywhere, but these 4 patterns are far from that! Below you can see the comparison pictures of all 4 tote bag styles, as it’s so much easier to SHOW size comparisons then it is to write about them! As you can see the size on these bags varies greatly, depending on the bottom and gusset style that the pattern has. Mimosa’s bottom is largest and so it has the most real estate for your stuff. (BTW we refer to people’s bottoms in Canada as an ARSE). Mimosa Tote: features a very spacious interior because of the oval bottom. In my opinion, this tote style holds the most. It has 2 handy exterior zippered pockets on the sides as well as 2 interior slip pockets. I absolutely LOVE the closure flap with the turn lock, however, to save money a magnetic snap may be used instead. The Mimosa is a more upscale look for a tote, and that’s why this one is my favourite! Purse feet may be used on the bottom if you choose. As well, there are many areas that you could showcase fussy cut fabric, pieced blocks or pretty hardware embellishments. This pattern calls for fleece and woven interfacing, with some stabilizer in the base, but NO foam in this one. My Mimosa above is done in Northcott’s Sesquicentennial line (purchased from Sew Sisters in Toronto) featuring a red cork leaf on each side. The side panels are made of metallic, faux leather from Fabricland in Canada. The Antique zipper tape and pulls are from BringBerry Hardware in New Brunswick, Canada. Lantana Tote: One of my favourite features of the Lantana is the method that is employed to attach the straps. They are inserted into a finished bag as the final step, and because they are riveted (or stitched) into folds in the finished bag, it changes the shape on top from flat/rectangular to a very wide almost square opening! Most people who make this pattern remark on this unique feature. Once installation of the triple set of exterior zippers is done, it’s fast and smooth sailing from there. Lantana is a fairly quick sew, and if you omit the 3 front zippered pockets, then you could really feature a large graphic print or a decent sized pieced block there. It would also be a great bag for the Quilt-As-You-Go method. A magnetic snap closes the bag top. The pattern calls for fleece and sew-in interfacing. I chose to add foam in the gussets and use woven fusible interfacing….. and I love how it stands on it’s own. My Lantana Tote above is made in red cotton with white piping and white zippers. Inside, the cotton is printed with red and grey maple leaves. The “eh?” is done in raw edge appliqued white faux leather. All from Fabricland in Canada. “eh?” Translation: Don’t you think? Conversational device that allows a non-confrontational Canadian to turn a statement into a poll of opinion or question. Trillium Tote: This pattern has recently had an update to it, and it doesn’t disappoint. It is well explained and not difficult to make. The main feature on this tote is the U shaped cut out on the main panels. It also sports 2 convenient exterior side panel slip pockets trimmed in faux piping. Inside, it’s spacious with a zippered and a slip pocket. A magnetic snap closes the bag. I really love the modern shape of Trillium and the top edge also has a lovely profile. The pattern calls for foam along with some woven interfacing, so it’s quite a stable bag, it stands on it’s own with no issue. The Trillium flower is the official flower of the province of Ontario, apparently they are illegal to pick, but I live in a vast area of forests and lakes, where these blossoms thrive. The province is sandwiched in the middle of the country. It has the most southerly point in Canada (Point Pelee), and also is home to Ottawa: our country’s capital city. Moonflower Tote: This pattern was conceived by The Cloth Albatross and then written, published and drafted by Blue Calla. It’s a fairly large but skinny tote. The pattern calls for all 4 sides to have a circle cut out on it for reverse applique. I chose to omit one large circle cut out because I had a huge Panel I wanted to use. It’s so easy to modify the exterior of this bag! The cut outs are an EXCELLENT place to feature a coveted fabric that you’ve been hoarding, or a pieced block, or needlework embellishment. The exterior pockets also have a sweet drawstring feature fed through a set of grommets on each side. Inside, there’s a large “half moon” shaped slip pocket, and a zippered pocket. You can choose to add some fancy hardware to join the straps to the bag, but the pattern doesn’t call for it, or much other hardware at all. The closure is a magnetic snap. This pattern calls for fleece and woven interfacing throughout. I used a stabilizer on the base. As a bonus, there’s a FREE pattern to match this bag called The Morning Glory Pouch. My Moonflower is done in the large Sesquicentennial Mounties panel in Northcott’s “Oh Canada” line (from Sew Sisters in Toronto), it’s combined with several other Northcott prints from the same line. The reverse side features the Canadian Trivia print, see below. Hardware on this one also from Emmaline Bags. “Mountie” = RCMP Royal Canadian Mounted Police- known for their unique hats, uniforms and horses. As always, sewing a Blue Calla pattern is a pleasure and produces something you can be proud of. There are many Free patterns available on her website, if you want to try one out! As for me, I am off with a pocketful of loonies and twoonies to buy myself a BeaverTail, I think I will go with Killaloe Sunrise this time….yum! I deserve a treat! Each blog has an exclusive giveaway, so be sure to visit them all. SCROLL down further for the TOUR GIVEAWAY, Rafflecopter link below!!! There are soooo many prizes! Please join us in thanking our tour sponsors by visiting their websites. Categories: Pattern Reviews | Tags: 150, blue calla, canada, canadian, maple leaf, mounties, sesquicentennial, tote, totes | Permalink. 1. I get unlimited free patterns (totally awesome), and I get to try the new ones before the rest of the world does! 2. Having a testing deadline FORCES me to finish things, even if I have no “sew-jo”. 4. I love being able to feel like my feedback, along with the other testers makes it possible for her to present an amazing product to her customers. Last week I tested the Juniper Toiletry Bag for Blue Calla. This is one of my favourite styles of bags to make and I sell many toiletry/make up type bags to my customers. Everyone needs one: men, women and children. This pattern is totally unisex and can be customized in sooo many ways. I usually sew 1 bag as my test bag for her and provide feedback….this time I sewed up 4, in 2 days! That is how much I love this one! Features: It has 2 zippers that open 2 separate compartments, a top carrying handle, and a very wide, flat bottom that won’t tip over. There are small pull tabs at the end of the zippers. Potential Fabrics: This can be made out of a huge range of materials, such as vinyl, cork, cotton, laminated cotton, waxed canvas and possibly even leather. As for interfacing, it requires a little bit of foam, fleece and fusible woven interfacing, and a piece of Peltex stabilizer for the base. Hardware: This one hardly takes any hardware, just 2 zippers, that’s IT!! You can always add more hardware to fancy it up, I added Bridge Connectors and Rivets and Feet to some of mine, but it’s not necessary at all. Skill Level: I would say this is for a confident beginner/ intermediate skill level, if you are comfortable with zippers, you should be OK. I always encourage beginners to try something they think is slightly out of their skill level, you will likely surprise yourself! It’s easy to omit the piping to simplify the bag slightly. As I mentioned above, I made 4 of these! 1 of my 4, I decided to do as Sewing Bag, to hold my hand sewing for travelling. I added an exterior divided pocket, used Sewing Theme fabrics and combined them with yellow marine vinyl. I was pleasantly surprised by how cute it turned out and it’s very useful too. There will be a tutorial for this simple customization on the Blue Calla Website when the pattern is released. I also did a classy metallic gold faux leather version. It was easy to quilt the vinyl to foam for the side panels, and I recommend this, to add a little interest to plain vinyl. I also added some shiny gold hardware, including a Handmade in Canada metal label, bridge connectors for the handle and purse feet. My zippers on this one have gold teeth and shiny gold pulls. I did NOT make vinyl piping for this, (as that sounds about as appealing as cleaning a toilet: I hate making piping), I used a metallic gold piping that is available at Hobby Lobby in the US. (I have never seen it in Canada.) I have included a photo of it alongside the popular Clematis Pouch to give a feeling of the size. Next one: I ordered in this perfect fabric called Jubilee by Melody Miller for Cotton + Steel fabrics. I combined it with navy vinyl. It was meant to go on a bag like this! I just love it. Finally, I did a “Tabby Road” version. I am a Tula Pink addict and although I am not really a cat lover (more of a dog person)…I broke down and bought a little bit of this line because the colours were really pretty. I combined it with lime green vinyl, and also featured a bit of the fabric’s selvedge on the handle. There are 2 different cats on this print, so I fussy cut each side to show off the 2 different kitties. If you need a quick Christmas, Birthday, Father’s Day, Mother’s Day gift..this is your pattern! From start to finish it took me about 2 hrs. This is something everyone can use in one way or another. I am going to make some for my kids for summer camp and personalize them with their names. The pattern will be available in 2 weeks! So, you’ve got time for some plotting and planning, or even a sweet little paper piecing for the side panel! Categories: Pattern Reviews | Tags: bag, cosmetic bag, juniper, quilted vinyl, review, sewing accessories, sewing bag, tabby road, tester, toiletry, tula pink | Permalink. I think it’s fair to say we all love FREE stuff, right? I test patterns for Blue Calla Patterns and I tested this adorable little pattern a while ago. This is the Sweet Pea! It’s a FREE pattern. Isn’t it just so … sweet? My daughters love this size of bag, but it’s also a great size for adults too. I used Anna Maria Horner’s Fibs and Fables combined with a cinnamon coloured faux leather on this one. It’s outlined in piping on the side panels, which by the way have a very refreshing silhouette. You also will learn how to make that little tassel yourself and can apply that to whatever bag you want! This bag is fairly easy to make, and also quick, so it’s great for a quick birthday or teacher gift. Enough already from me…go get your FREE pattern here. Come back and let me know what you think?? Categories: Pattern Reviews | Tags: bag, blue calla, free pattern, girl's bag, kids, mini, purse, saddlebag, sweet pea | Permalink.